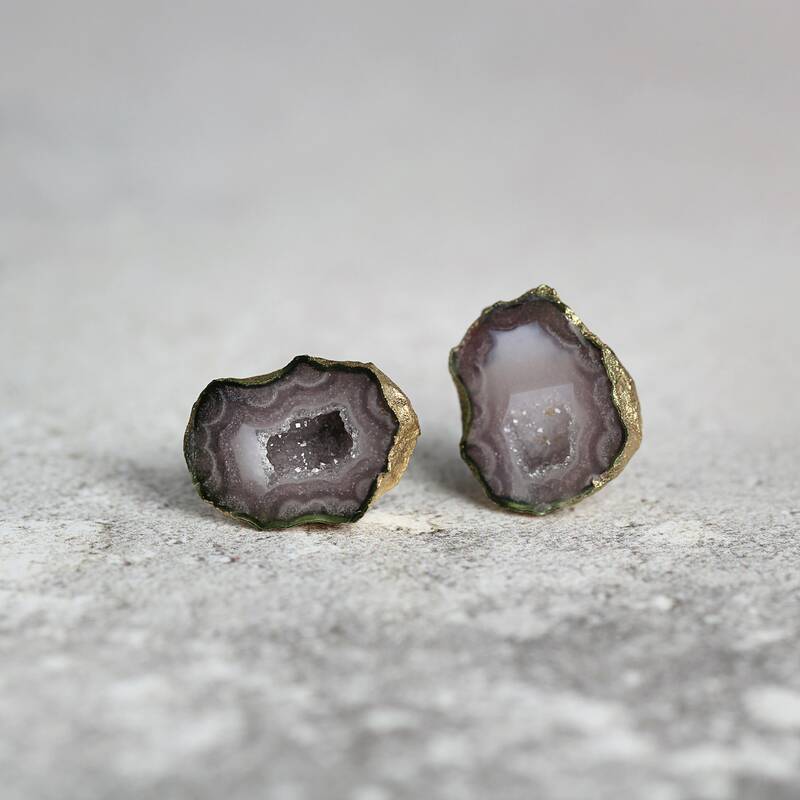 Raw geode stud earrings made with unique and precious raw geode halves - wonderful reminders of the beauty of nature! Featuring exquisite little brown geodes that show their sparkling crystal centre. Known as 'Tabasco' geodes, they are named after the region in Mexico where they are found. This pair is totally unique, one-of-a-kind and well matched, with beautiful patterns and crystalline structure. Geodes are natural rocks that are plain and uninteresting looking on the outside but can have beautiful crystals on the inside. They are created in hollow areas of soil such as animal burrows or tree roots, or even in the bubbles in volcanic rock. Over time, minerals seep into the hollow area and harden into an outer shell creating the geode. The minerals then continue to form on the inside walls of the shell, growing towards the centre, creating the unique crystal formations and patterns. It can take hundreds of millions of years for the space inside a geode to be filled, and many geodes remain partly hollow. 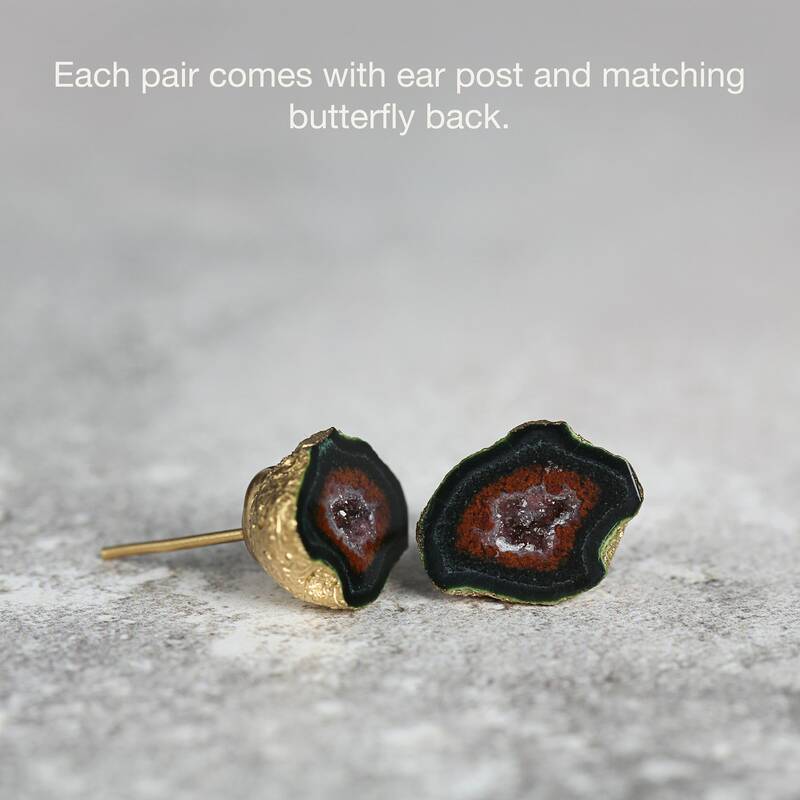 These geode earrings make a delightful gift for a loved one - for mum, sister, friend, wife or girlfriend - for any occasion such as a birthday, a graduation, an anniversary, Valentine's or Christmas gift, or just for someone who would enjoy the unique qualities of these beautiful stones. One-of-a-Kind earrings. Ready to ship. * Pair 11 - geodes measure approx 12 x 10mm.